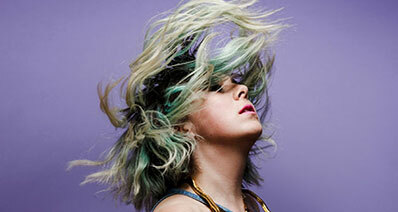 Want to learn how to transfer music from iTunes to the iPod? There are a variety of different ways that you can go about doing this. The most traditional method, of course, it just to go straight to the source by making use of iTunes sync options. However, that’s likely to lead to some difficulties if you want to transfer songs that are not purchased from Apple Music. That is why we’re going to be introducing you to other methods as well! Including a no-stress transfer tool that you can use, and a couple of tips and tricks for when you’re really struggling. The first thing that we’re going to teach you how to do, is how to transfer music from iTunes to iPod without iTunes. For this, we’re going to be using a special transfer software called iMusic. It’s a program that was made specifically for transferring music from iTunes to iPod, allowing its users to completely bypass the limitations enforced by iTunes Apple Music policies. 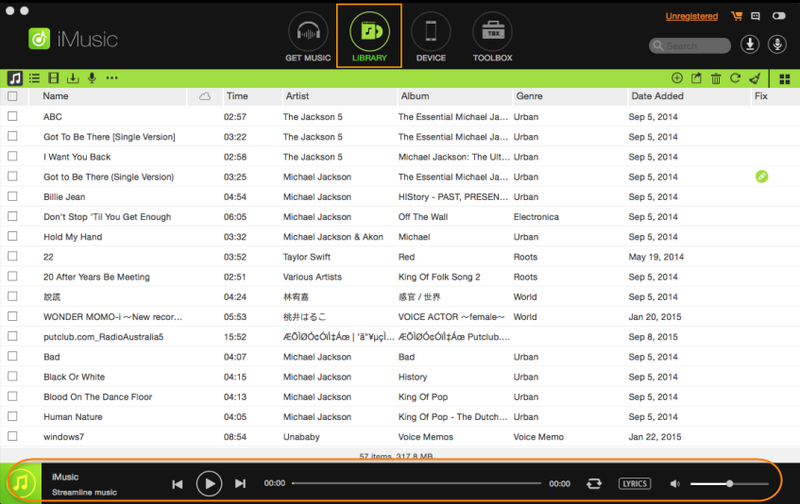 Basically, with this tool, you can move your previous songs from one place to another without stressing about the possibility of your data being deleted permanently. Transfer songs/videos from iTunes to iPod with Simple Clicks. 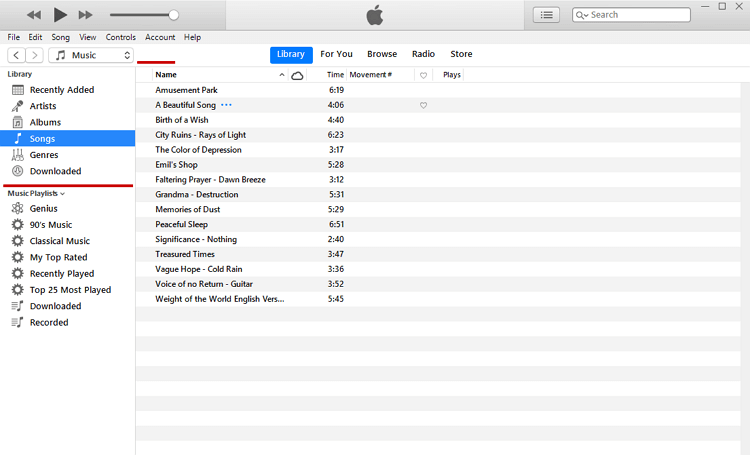 Full iTunes to iPod transfer and vice versa. Restoration properties from PC to device. Extra Toolbox for managing transfer process. Prevents duplication by thoroughly scanning source and device. Premium features (e.g. Device to Device music transfer). Note: Instructions as to how to proceed will be available for first-timers. 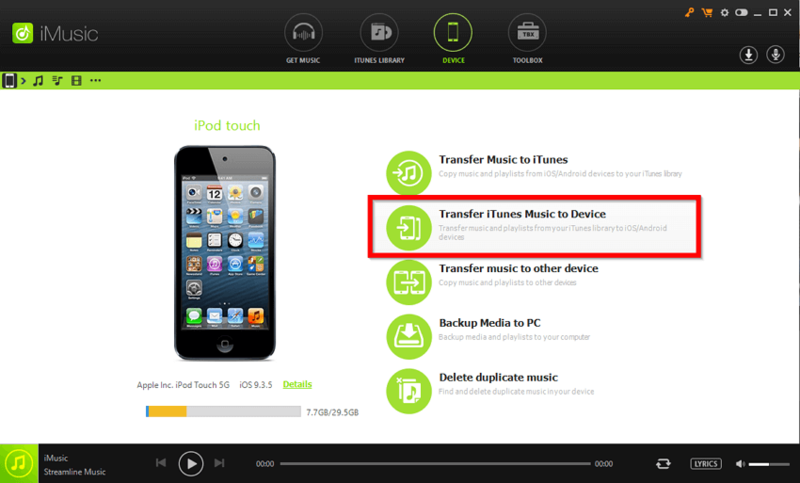 If it is your first time using your PC to transfer music from iTunes to iPod, then you’ll need to give it access. This is a fairly straightforward process. 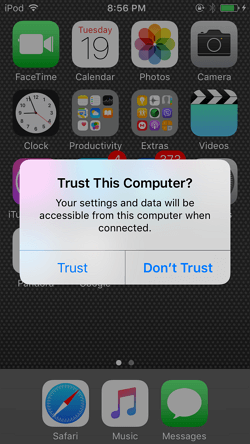 Simply select the Trust this computer option when it pops-up on your iPod screen. 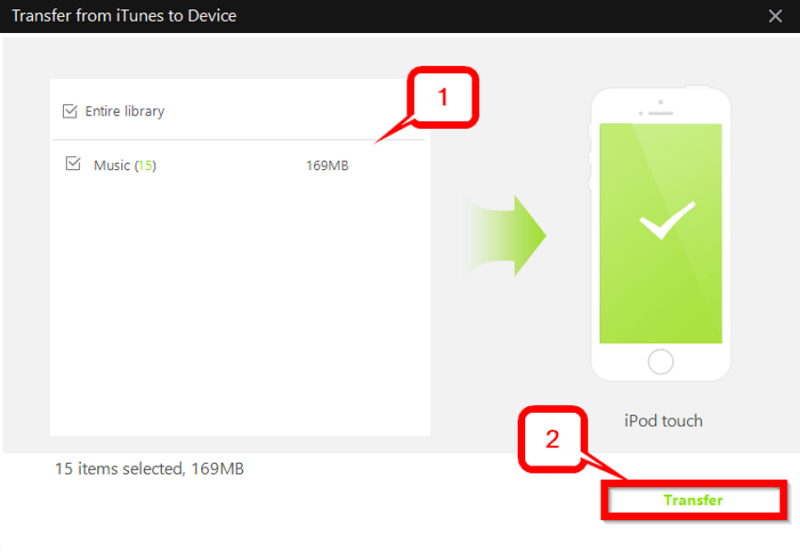 The DEVICE page should now have changed in order to display your iPod and the transfer options available. There are a couple of main ones to choose from. 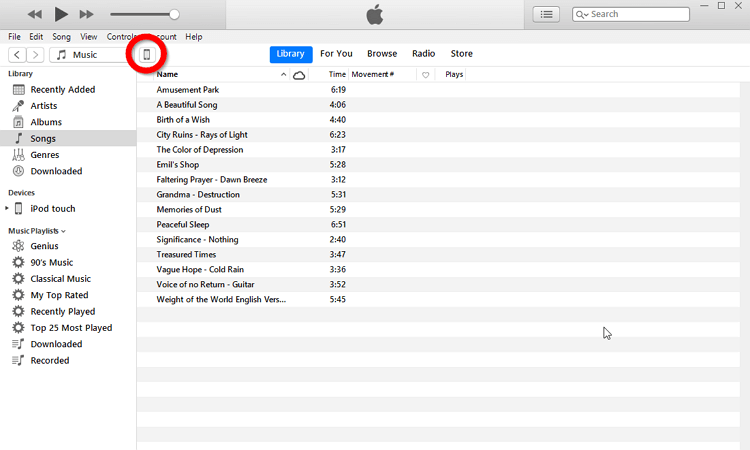 However, the one that is relevant to us is the "Transfer iTunes Music to Device" option. 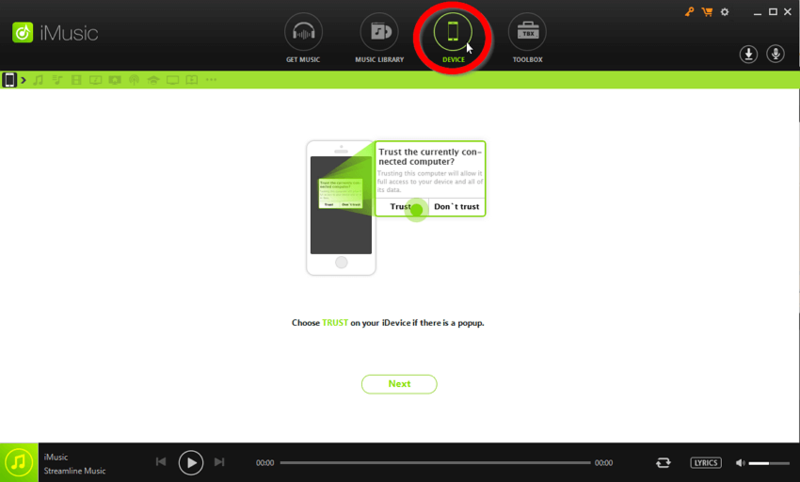 Select the “Transfer iTunes Music to Device” option and wait for the secondary screen to appear on your screen. 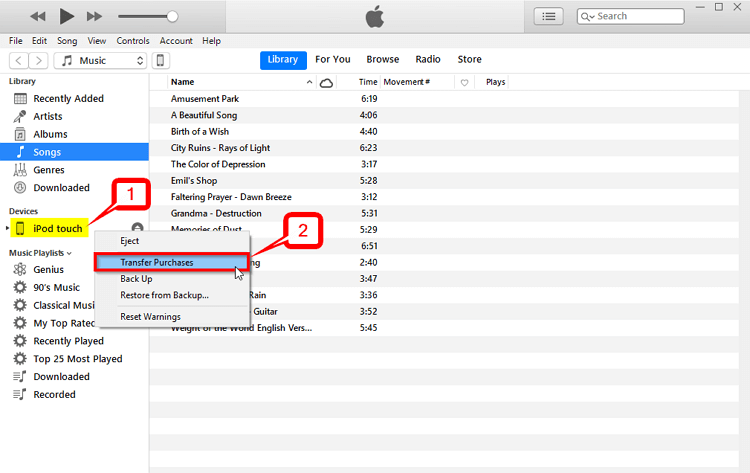 A secondary screen should appear to give you the ability to select the music that you want to transfer from your iTunes library to your iPod. 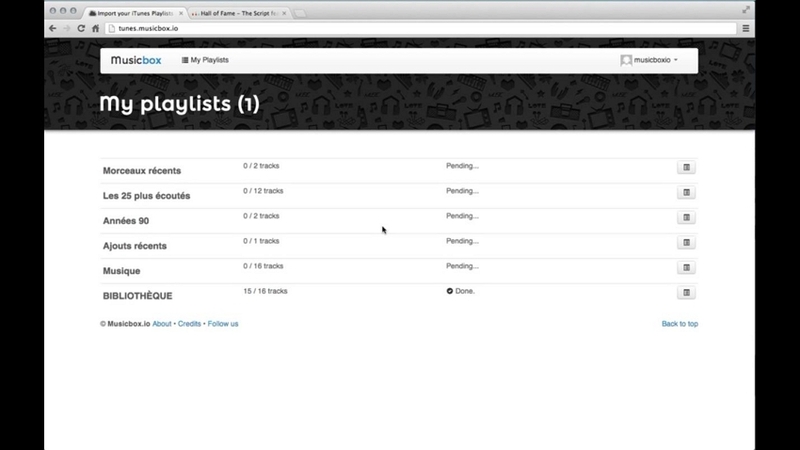 Select the relevant songs from the available list, and then, finish it up by clicking the Transfer button. Now that we’ve gone over the stress-free method of transferring music to an iPod, let’s talk about how you can go about it the traditional way. That is, to directly use the iTunes software. One of iTunes’s great features have to be its ability to automatically sync a PC to a device. That means, all the data on your PC can be transferred to your iPod easily. Of course, it’s not without its faults, but we’ll go through the limitations of using iTunes later as we go along. First, you’ll need to have your device connected to your PC. If it is, then you should be able to see a little device icon on the top right-hand corner of the screen (marked with a circle in the image below.) Click that icon in order to access your device’s settings. If this error message appears on your screen (shown in the image below), then that means that you have items on your iPod that is not on your iTunes library. 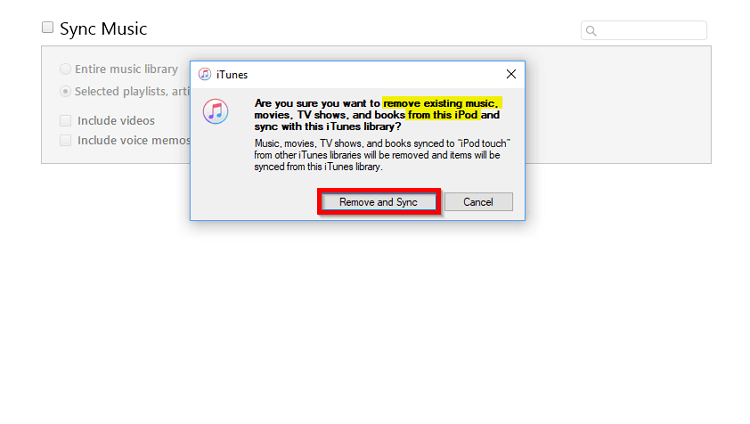 If you select the “Remove and Sync” button, then you continue with the iTunes to iPod transfer without a problem. However, just know, that it will remove all the songs that you have on your iPod. If you do run into the “Remove and Sync” error, or any error really, then you should know that there are ways of fixing it! These solutions will all depend on how the error occurred, and it’s different for everyone. Because of that, you might have to try or check a couple of things before you can solve your problem. 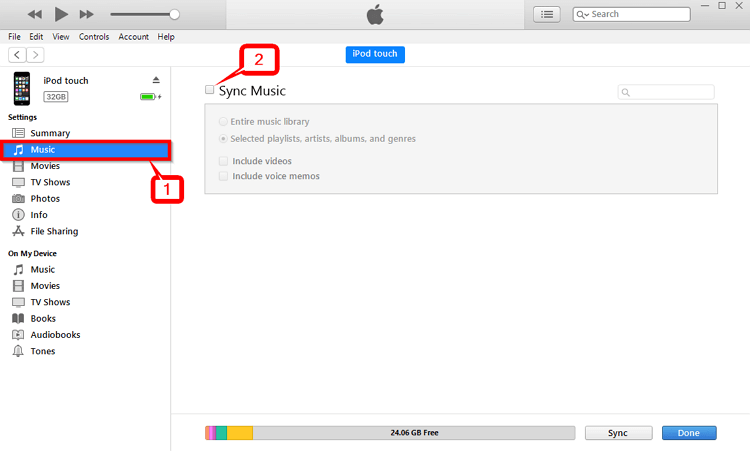 If you find that only some of your iTunes music has been moved to your iPod, then one of the issues might be that you have the wrong sync options selected. 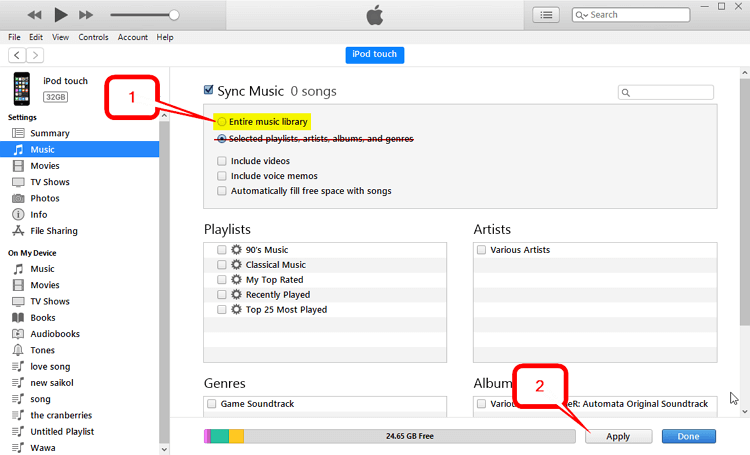 If you go back to your sync options, make sure that you have the “Entire Music Library” selected and not anything else, as this might be the reason that only some of your items have been transferred. As mentioned, the remove and sync issue are the most common problems users face when it comes to not being able to transfer their music onto a device. There are two ways that you can fix this issue. Either you use a program like iMusic in order to transfer data instead (no limits are imposed if this transfer software is used) or you manually transfer the songs a bit at a time rather than relying on the automatic sync option. Again, if you find your purchases missing during the transfer, then you might want to consider transferring purchases. This is a method that you can use in order to make sure that all your purchases match up. Of course, it will require that you use the same Apple Music account for both your iPod and iTunes library, but that shouldn’t be too much of a problem if you purchase your music solely from the Apple store. 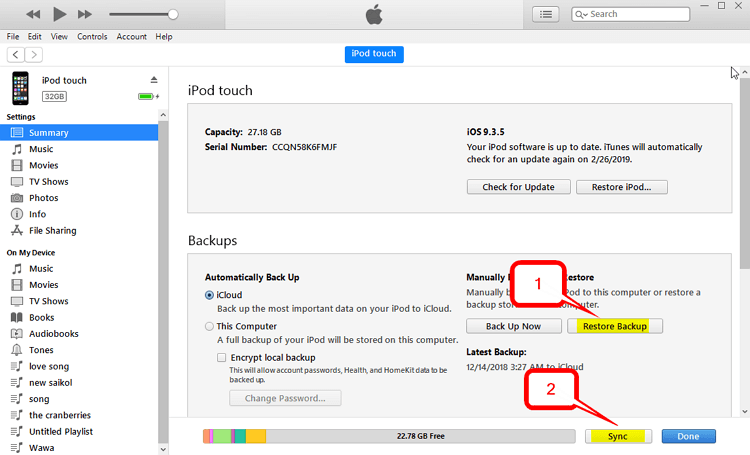 If the data on your iPod and your iTunes are still not matching up properly, then it might be good to restore a backup state. This way, you can go back to previous device state and make sure that your iPod is clean of any corrupted data. Another issue might be the actual connection between your iTunes and iPod. If it is unstable, then the sync won’t go through properly. Make sure that you have a good cable or try out the Wi-Fi sync or iCloud sync methods instead to see if that will work better for you. Conclusion: That concludes our quick review of two methods that you can use in order to transfer music to an iPod. Of course, both of these are open to you. However, if you prefer a way of doing it without the stress of Apple’s many limitations, then the iMusic method is definitely the way to go. This is especially true if you purchase or download your music from elsewhere. At least now, you won’t be forced to rely solely on Apple Music purchases — which can build-up over time.